From the innovative minds of Disney•Pixar comes a hilariously heartwarming adventure about the power of confronting and overcoming your fears and discovering who you are meant to be. The Good Dinosaur asks the question: What if the asteroid that forever changed life on Earth missed the planet completely, and giant dinosaurs never became extinct? In this epic journey into the world of dinosaurs, an apatosaurus named Arlo makes an unlikely human friend. 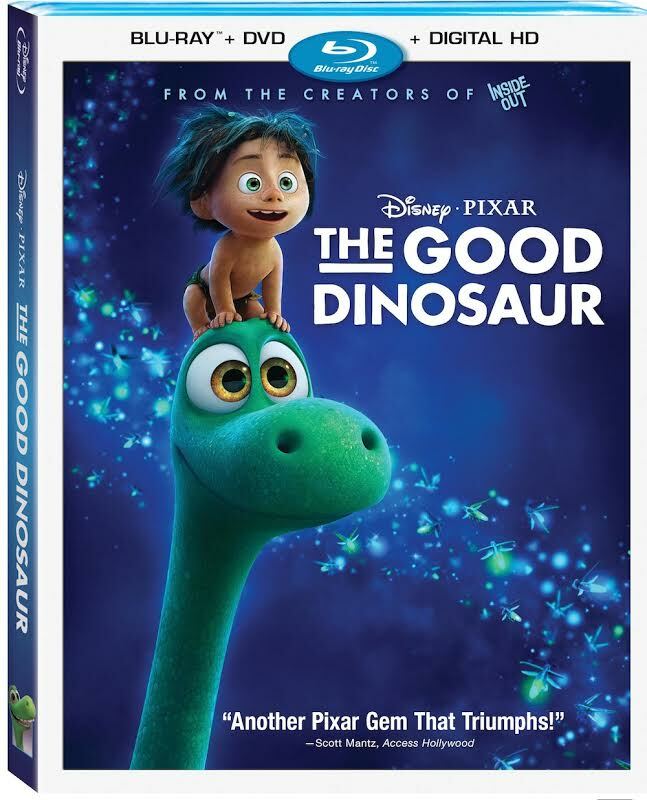 While traveling through a harsh and mysterious landscape, Arlo learns the power of confronting his fears and discovers what he is truly capable of. I went into this movie only know it was about dinosaurs, that is all. I mean it came from Disney and Pixar....so I knew it had to be a great movie. The story line is familiar, it reminds you a little of Lion King. A lost child trying to find his way home, along the way making some amazing friendships and really learning how strong he is. There are a lot of great lessons to be learned for kids, it teaches the importance of family, friendship and 'making your mark' in life. 'Making your mark' is about Arlo discovering himself and what he is capable of. It teaches him that he doesn't need to be his dad,brother or sister...just the best Arlo he can be! It also teaches kids about overcoming your fears. My daughter is a tender heart and did shed a few tears along the way, but some where happy tears too. This was a truly great movie and I am looking forward to watching it again and again! Theatrical Short: "Sanjay's Super Team". This is a super cute short about a your boy who just wants to watch super hero shows and play with his toys. His father makes him mediate along side of this and from their he daydreams and imagines that the Hindu gods are superheroes. Both father and son soon realize more about each other and understand each other better! The Filmmakers' Journey: Director Peter Sohn And Team Share Their Experience Of Making The Movie A great what to see how this film is made and all the hours, time and devotion it took to create movie! True Lies About Dinosaurs: Learn What Separates The Movie's Dinosaurs From Real Ones. The people at Pixar know not everything in this movie could of truly happened, but it was a super cute film anyways. In this special segment they will teach you what could of been a truth and what was a lie for the film. I will give you a hint...some of the dinosaur species were never alive at the same time! Recyclosaurus: The Crew Competes To Create The Best Dinosaur Ever... From Discarded Items! After watching this, I wanted to work at Pixar. It was so amazing to watch the creativity and see how they created the dinosaurs. Even giggled when they pointed out the cheaters! It just goes to show you how your trash is another person's treasure or item to create a dinosaur!